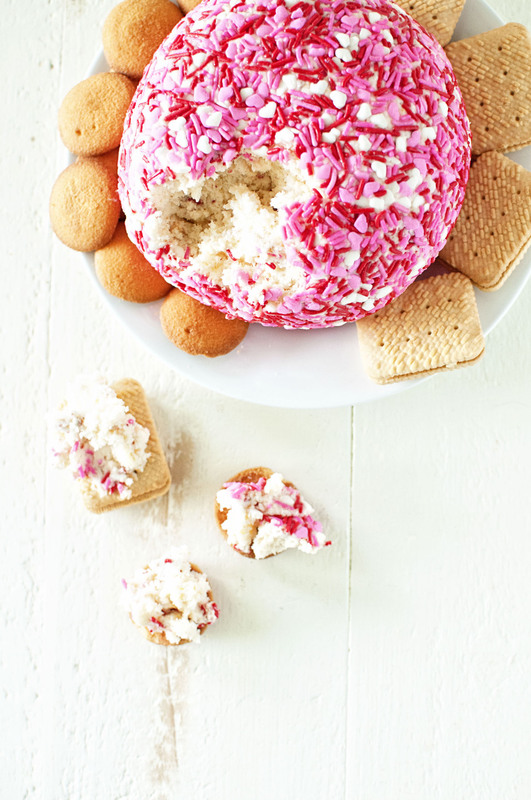 Angel Food Cake and Strawberry Cheesecake Cheeseball: Cream cheese, butter, and powdered sugar all mixed with angel food cake mix, dehydrated strawberries, white chocolate chips, and angel food cake pieces make up this delightful cheesecake cheeseball. I carry around a little notebook with me almost everywhere I go. It’s for ideas. Things that inspire me…mostly about food. I have twenty-seven…yes, twenty-seven ideas for cheesecake cheeseballs. And yes, I will probably make all of them. They are easy and tasty and festive! Also, no bake. 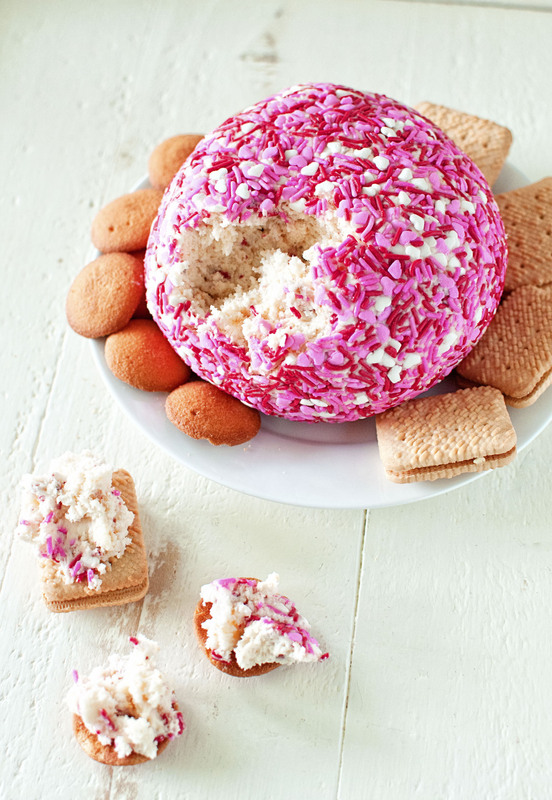 So this summer will be ice cream and cheesecake cheeseballs galore! Growing up whenever my mother was on a diet we had Angel Food cake. Because it was healthier because of less fat…or at least that was the big push. We would get a slice of Angel Food cake with sliced strawberries and a blob of Cool Whip on top. This cheeseball is a nod to that. I usually buy my freeze dried strawberries at Trader Joe’s but apparently all the dieters hoarded them as I could not find them the last two times. So I had to order on line. Since I use them all the time I decided to buy a big tub of them. Turns out the site I bought it from are for like survivalist types. But it’s all good because I liked their product and they had some really cool freeze dried food that I’m totally going to explore a little more. 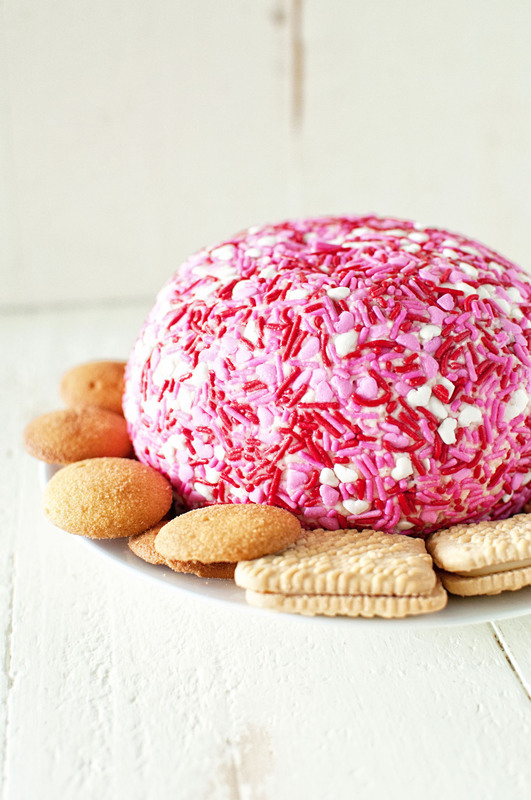 I decided to roll this cheeseball in valentine colored sprinkles because I hardly have any valentine stuff on my blog which is odd because I love Valentine’s day…well, I like valentine decor. Also, you maybe saying Valentine’s already? Yep, it’s like a month away. So yeah, start planning. Fold in the chopped strawberries, white chocolate chips, and Angel Food cake pieces. I’m so sorry to hear about the scare with your husband. That must have been so frightening! I’ll kee you both in prayer. Glad that he survived, and I hope his health improves as well as your families peace of mind, too.